The amaryllis kits are almost here! 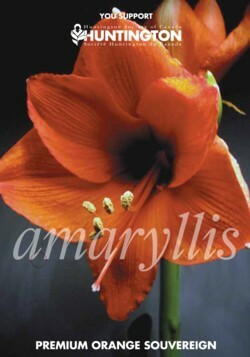 It is hard to believe, but amaryllis kits will arrive in Calgary in two weeks! Each kit comes in an attractive gift box and contains one high-quality Orange Sovereign bulb, growing instructions, soil, pot and saucer–everything except the water. Bulbs can be planted immediately or stored in a cool, dry place for holiday gifts. Gorgeous orange-red blooms will appear approximately 6-8 weeks after planting. Kids are fascinated as they watch their bulb quickly develop into tall flowers. Office mates compete to see who can grow the tallest plant. Everyone loves to have their holidays or workplace brightened. Join our amaryllis volunteers and help grow a brighter future! Order by contacting Karen or your usual seller. Join us for another amazing golf event on June 11th at the Earl Grey Golf Club. Sponsorship opportunities also available. Team HD is in the Scotiabank Charity Marathon again for our second time. Last year we were able to raise $12,800 and this year we hope to raise $20,000 while also increasing the size of our team to raise awareness. If you want to be part of our team but don’t like running, no problem. There are various distances in this event – 5km walk or run, 10km run, half marathon and full marathon. If you don’t want to participate but can help us reach our goal please go to https://secure.e2rm.com/registrant/LocationHome.aspx?EventID=84754&LangPref=en-CA&locationID=84777&Referrer=direct%2fnone to make a secure online pledge. If you prefer cash or cheque, please still use that website and contact Melissa Lingard for dropping off the donation. We are definitely looking for sponsors so we can reach our $20,000 goal. We are also looking for more people to join our team. When you join our team you will be getting a technical t-shirt with our Team HD logo on it. Event page on this blog.